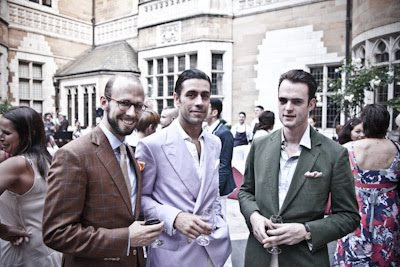 Friday was the annual MTBA summer party (Master Tailors’ Benevolent Association). It’s one of two events every year that brings together all the tailoring fraternity and is consistently a great event (the other big gathering being the dinner just before Christmas). The Merchant Taylors’ Hall, where it is held, is a wonderful series of rooms around a stone courtyard dating back to 1347. It was particularly lovely this year, as the shelter and stone construction made it a cool place to spend a hot summer evening. 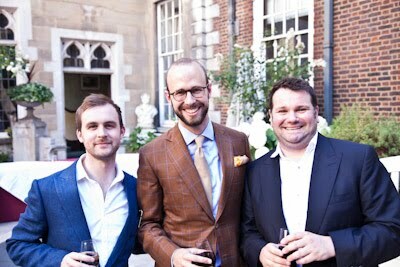 Sharing a few pictures of the night, at top is myself with Graham Browne cutters Dan (left) and Russell (right). Below are another Dan (left), a tailor at Anderson & Sheppard who received an MBTA certificate and Eric Musgrave (right), author of Sharp Suits and now director general of the UK Fashion & Textile Association. Bottom is myself, again, with Karl (centre), front of house at Anderson & Sheppard, and James (right), a coat cutter at A&S. You can follow the discussion on A lovely night at the Taylors’ by entering your email address in the box below. You will then receive an email every time a new comment is added. These will also contain a link to a page where you can stop the alerts, and remove all of your related data from the site. A gathering of some real names in the industry, must be great to spend some time with these guys, and yourself of course Simon! Coincidentally I was just looking at my copy of Sharp Suits at the weekend! I take it you were the only man wearing a tie? You appear to be the only chap wearing a neck tie. WTF?! 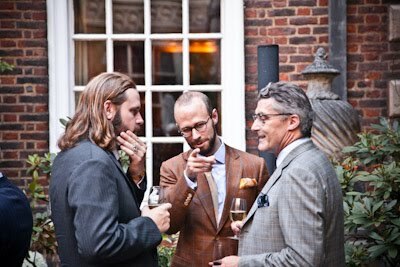 The dress code was certainly rather patchy, but fear not many men were wearing some very elegant ties. Anderson & Sheppard’s head cutter Mr John Hitchcock was one, worn with a lovely summer double-breasted. And though you can’t see it, Eric is actually wearing a nice brown satin tie with his suit – picking out the brown overcheck in his jacket. How long have you been associated with the MBTA? Looks like a wonderful affair. TS, I’m not associated with the MBTA, I was merely there as a guest of my tailor, as many in attendance were.